IF being a lyricist, musician, composer, songwriter, actor, comedian and writer was not enough for Tim Minchin, he has added doctor to his list. While in his hometown today, touring his fifth solo show Back at Crown Theatre Perth, Swanbourne-raised Minchin was presented with a Doctor of Performing Arts honorary degree in recognition of his outstanding contribution to the performing arts. 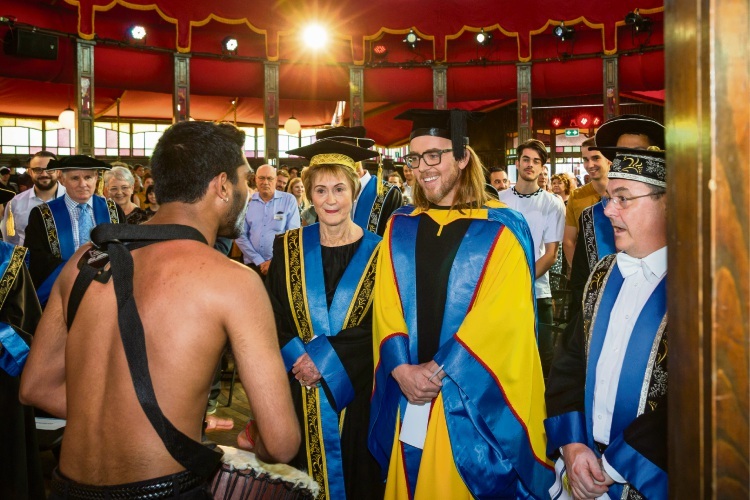 The ceremony took place in ECU’s Edith Spiegeltent with a Welcome to Country by Shaun Nannup. There were performances by contemporary music students and the WAAPA Gospel Choir of This Is Me from The Greatest Showman and third-year music theatre students sang a number from Sondheim’s musical Company. ECU Vice-Chancellor Professor Steve Chapman described the Matilda the Musical creative as passionate, fearless, down to earth, humble and irreverent, which was everything you could possibly hope for in a graduate. “I’m hugely grateful and more than a little embarrassed to be honoured like this,” Minchin said. “My time here at WAAPA was quite hard actually; being an artist requires massive reserves of self belief and coming to a place like this is incredibly testing. “Of course I know now that the two years I spent here feeling unbelievably bad about myself was simply training for the subsequent eight years where I felt even worse. “It was the beginning of a lesson that I’m still trying to learn that comparing yourself to others in any area of your life is poison. Pavan Kumar Hari, Kerry Sanderson, Tim Minchin, Steve Chapman Picture: Stephen Heath. Minchin’s self-deprecating humour was peppered throughout his speech, including a reference to his failure to learn how to read music. But his message to students attending the ceremony was clear: be good at what you do, be authentic and be kind. “If this was a graduation ceremony my role here would be to give career advice to the graduates, it’s not,” he said. “But I guess I’ll try to give advice anyway because I’m quite old now and giving unsolicited advice is what old, white guys are supposed to do. “My career is clearly such an absurd fluke… it was a fluke because it turned out having my weird combination of attributes allowed me to make some stuff that happened to find an audience in a particular place and time. “My career began in my late twenties when I finally stopped trying to be what I thought other people wanted from me. “The minute I stuck everything I am on the stage, the moment I wore what I wanted, said what I wanted, put together a show that had me doing weird poems and monologues while playing jazz, pop and rock, the moment I got authentic, my life changed. “Don’t make the mistake that thinking little old you is not interesting to the world. Minchin graduated from UWA with a Bachelor of Arts before studying a two-year Advanced Diploma of Contemporary Music at WAAPA. UWA awarded Minchin a Doctor of Letters honorary degree for his contribution to the arts in 2013.